When you’re a global company like Danpal, with branches on five continents, you understand the geography of roofing systems a little bit more than most companies because your structures have roofs, too! Danpal’s fifty years of experience show the results of the company’s commitment to research and development. These results have produced the kind of technological advances that have taken roofing systems to twenty-first century levels of innovation. Our clients rely on us to provide the most current, up-to-date products available so that their structures will benefit from that technological edge that Danpal delivers. We’re confident that we can help you choose the right roofing system that’s designed for your region’s climate as well as your personal budget. Where In The World Is Your Weather? Choosing a roofing system is a vital part of the design process. Your roofing system must be able to protect your building from the threat that external elements like weather can present. If you choose a roofing system that’s made of high-quality materials, you’re going to ultimately save money, because that system will be designed to offer protection for a long time. Remember that roofing systems aren’t all the same, nor should they be. The roofing system that you choose will be one that is geared toward the climate of the region in which your building will stand. The first point of attack for weather when it strikes is the roof of your building. That’s why your roofing system has to be durable enough to withstand that first onslaught of rain, snow, hail, wind and even the hot sunshine. Every form of weather that we experience has the power to cause damage to a building. But Danpal roofing systems have the power to protect buildings from weather. By preventing leaks from occurring, your roofing system can keep your building dry inside. An investment like a roofing system can seem like a lot of money. But when you consider that the roofing system that you choose will be protecting your structure from weather damage, leakage, moisture penetration and mold, you realize that the investment is a worthwhile one. But if you think that economizing by choosing a roofing system that’s cheaper will be a bargain, think again. Cut-rate quality means problems down the road, and those problems are going to cost money. Once moisture has invaded the interior of a building, it’s only a matter of time until it begins to cause deterioration. The damage the mold can cause isn’t limited to your building. Mold is a health problem that affects the occupants of a building, particularly people who suffer from allergies or respiratory ailments such as asthma. Choosing the right roofing system is the first step for creating the building that’s designed to last. Danpal technology and your budget, working together, provide the roofing system that’s right for your climate and your building. 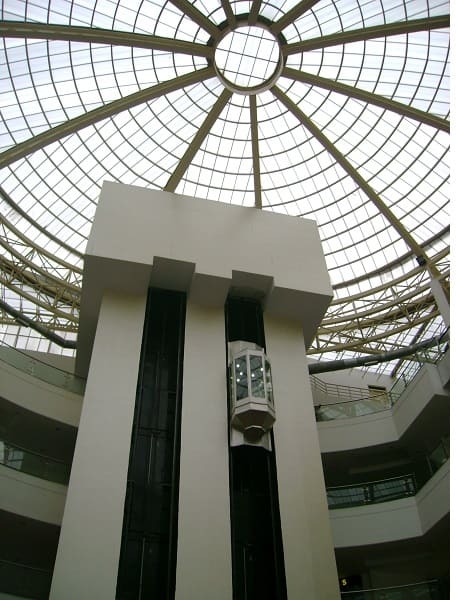 Danpal roofing system is a translucent, dry-glazed system that’s used in many engineering products throughout the world. Its flexible design is built using the latest microcell technology to provide increased translucency and strength. The roofing system is incredibly popular thanks to its array of features including its high impact resistance and excellent thermal performance. You will find four variations of this system, with each one being perfect for a specific environment and project. While the installation may differ between these systems, they still all provide the same exceptional benefits. 100% Leakproof: The Danpal roofing system passes all the necessary tests to ensure that no water makes it through the roof. It has superior water and air tightness which means it’s ideal for all weather conditions. 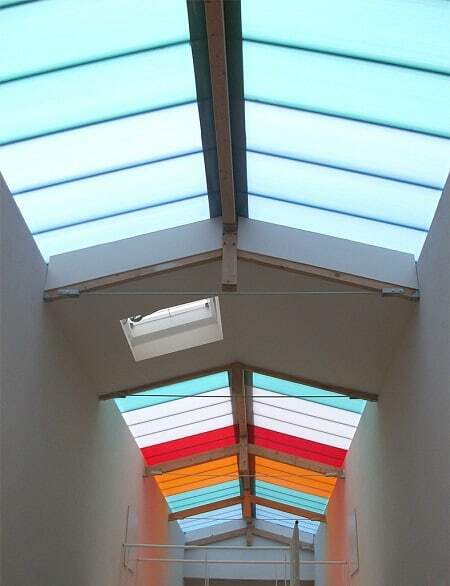 Lightweight: The panels are incredibly lightweight which makes installation much easier and less time-consuming. Multiple Colors: Danpal’s roofing system is available in various color combinations meaning you get to customize your roof to follow a specific design mission. High thermal insulation: Each panel is designed with a specific cell structure that helps provide industry leading thermal insulation. Heat is kept inside, and this greatly improves the energy efficiency of your roofing system. 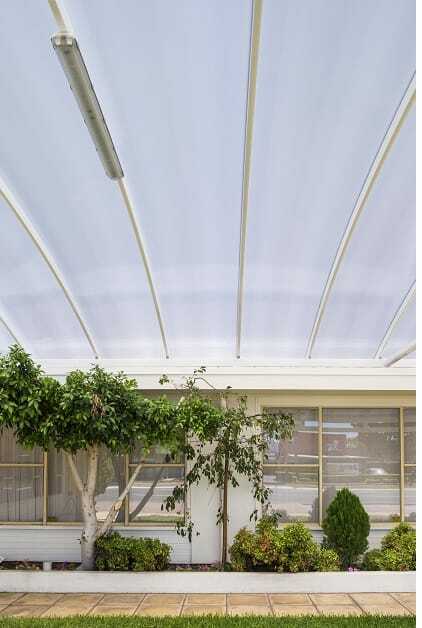 Unrivaled UV Protection: Thanks to the revolutionary technology in the Danpalon roof panels, fewer UV rays get passed through this roofing system. As a consequence, there is excellent UV protection, which extends the system’s life. 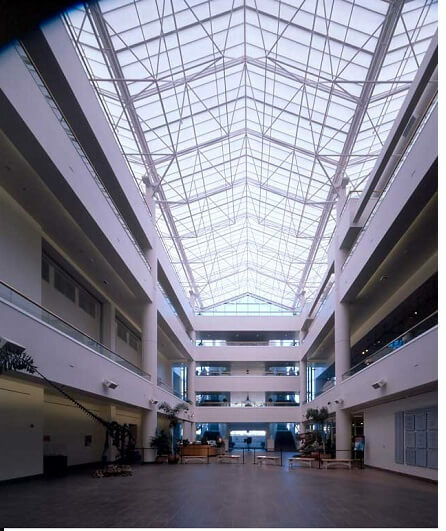 High impact resistance & strength: The roof panels are designed with strength in mind and are impervious to high impacts. The cell structure of each panel combined with the unique double tooth grip-lock connection helps strengthen the roofing system and prevent weather damage from occurring. Cold bending of panels on-site: Unlike a lot of other roofing systems, the panels can be bent on-site without the introduction of heat. This allows you to bend and manoeuvre each panel to your own design based on the structure you’re building. Danpal’s roofing system is a work of architectural art. 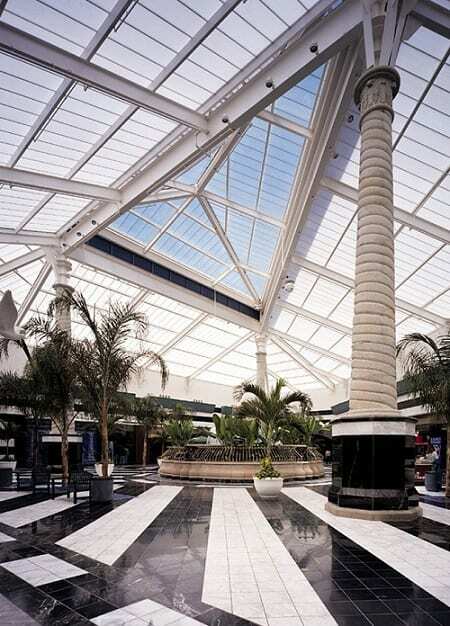 It allows you to provide a building or structure with a lightweight roof that works in all weather conditions, lasts much longer than traditional glass roofs, and has exceptional thermal and UV performance. We pride ourself on being able to create phenomenal architectural systems that are perfect for transforming light into a powerful tool. 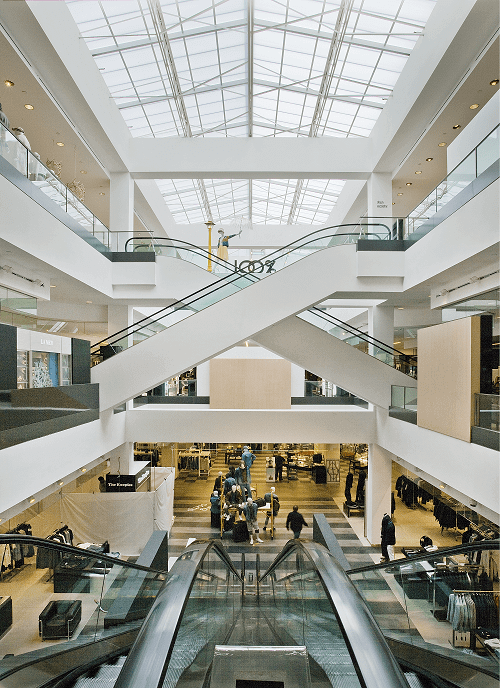 Our systems provide architects with the tools to create environments that harness the power of natural daylight. Danpal operates all over the world and has been in operation for over three decades. Innovation is key, and every Danpal system is built to push boundaries and open opportunities for architects and interior designers throughout the globe.